Sometimes I fancy a pint of cider. It’s not that frequently I’m afraid and with a house full of beer of varying kinds it doesn’t happen often at all. It’s usually a yearning in the late spring and summertime, as I find a good cider can be most refreshing. Today I fancied a cider in the afternoon. It’s cold outside and with the heating on I fancied a cider to help cool be down without the need to simply either switch the heating off or go outside. 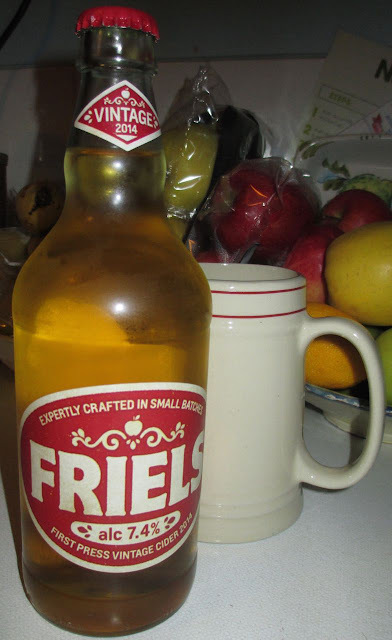 This 7.4% volume Friels cider is a ‘vintage’ from 2014. I guess cider matures sooner than some wines? Anyway, made in small batches from Red Falstaff, Katy and Windsor eating apples from their Hereford and Worcestershire orchards, I felt pretty privileged to have picked up a bottle. Lighted fizzy and presented in a traditional looking 500ml bottle with a fetching feminine winking apple picker on the rear label, this craft cider bubbled merrily in my beer mug waiting for my first sip. This cider has a nice sweet crispy mixture of apple flavours all mixed into one. There is sweetness in the initial flavour followed by an edge of bitterness that rolled around the mouth into the aftertaste. Very nice indeed, very tasty and refreshing, and just what I needed on an overly heated lazy afternoon in front of the television.